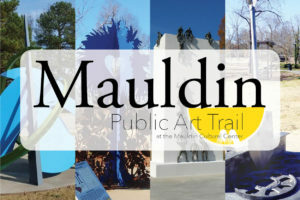 The City of Mauldin’s Office of Cultural Affairs announces the opening of the RFP portion of the selection process for the 2019 Mauldin Public Art Trail installation at the Mauldin Cultural Center. This annual program seeks to beautify the community with public art displays created by South Carolina artists for years to come. The RFP and application are available online at mauldinculturalcenter.org/public-art-trail. Contact the Office of Cultural Affairs at (864) 335-4862 with any questions.